I made this champagne punch last year for Thanksgiving and I'm making it again this year because it was such a hit. It's refreshing and light and goes perfectly with your turkey dinner. It is very pretty too with the lemon and sage ice ring in the punch bowl. Make the ice ring: Arrange lemon slices and sage in bottom of Bundt pan and fill with cold water, leaving about 1" of space at the top. Freeze until set, at least 6 hours and up to overnight. 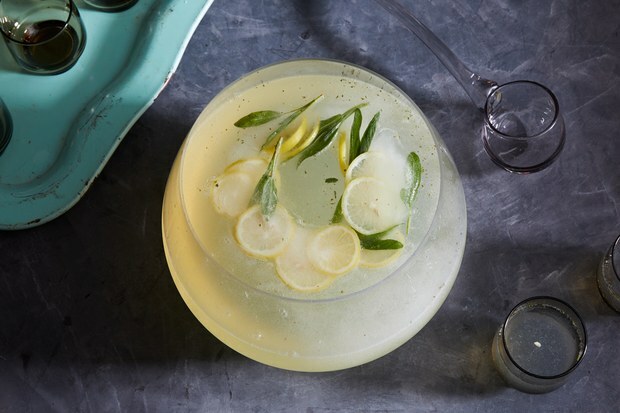 Make the punch: Muddle lemon zest, sage, and sugar in a measuring cup with a pour spout until sugar starts to turn green. Add 2 cups warm water and stir until sugar is dissolved, then let sit 10 minutes to infuse. Stir in lemon juice, then strain through a fine-mesh sieve into a large punch bowl. Stir in gin and ginger liqueur. Just before serving, dip bottom of Bundt pan into a bowl of hot water. Place a plate over mold, invert ice ring onto plate, then transfer to punch bowl. Pour in sparkling water and wine and stir gently. Punch, without sparkling water and wine, can be made 2 days ahead; transfer to an airtight container and chill. If you don’t have a punch bowl big enough to hold the full amount, start by filling it with half of the recipe, then refill throughout your party as guests continue to drink.